Not a film I anticipated with any great optimism, as Ridley Scott, the director of the first film, a masterpiece recognized only after its unspectacular theatrical performance and the oh-hum reviews, was an erratic director, to be kind. He was very capable of making movies that while boasting an attractive style, would let you down with half baked story lines and conventional Hollywood endings, whether they be upbeat or bleak by the end of the last reel. 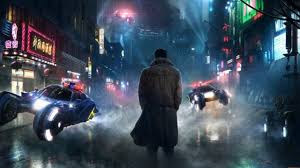 Fortunately, smarter judgment prevailed and director Dennis Villeneuve--Sicario, Arrival, Prisoners-- was brought on bard to extend the replicant saga. Fittingly, the film is a luscious, lovingly detailed and poetically blurred vision of a polluted and decimated Los Angeles and western United States, and the enticing and confounding issues that arise from the creation of very human like androids to essentially function and exist as nothing other than a disposable slave class remain with us. The smart matter here is that the right story elements are drawn from the original film,the right characters are brought back to furnish us with ideas as to how matters have changed over thirty years , the mysteries have deepened more so , and the mysteries remain. BR 2049 has all the issues the lured us in from the original motion picture, but it is its own majestic,dystopian saga. It is equal parts meditation, philosophical debate, action movie, love story and, above all, a mystery, all the strands perfectly fused together seamlessly. This film is a masterpiece. Writer and director Edgar Wright, we've read, has directed a heist film that is as much a musical as it is a crime comedy. Well, yes, in as much as the title character, actually named Baby Driver, loves to prepare special mix tapes while dancing , highlighted frequently in this film. The steps actor Ansel Elgort executes in these scenes are fairly elegant indeed, Astaire like to a degree. Don't let that stir you off, though, as what Wright creates is in keeping with previous work , which is zany, witty, subversive of the genre he's working in, but never so busy with his technical virtuosity that he forgets to bring the fun the audience came for. Our hero is a fantastically gifted getaway driver indentured to a ruthless crime master .Finding love at last, Baby finds himself attempting some impossible ploys to free himself of teh clutches of his boss so he can go off and find happiness and some kind of normalcy after a life of forced criminal activity. Not an original premise, but it's merely the starting point for Wright, he subverts the cliches , veers in another direction other than where you expect him, expands and contracts the minimal plot particulars, and keeps matters moving, moving , moving with a quick but sure sense of how to keep the many balls he has in the air from hitting the floor. Wright also draws fine performances from Jamie Fox, Jon Ham and the ever effusive Kevin Spacey as the harshly ironic crime boss. Expect double, triple and quadruple crosses here as the matters pile on, and expect many a "WTF?" moments and to burst into laughter at unexpected moments. Baby Driver is an exercise in exhilarating virtuosity. Director and writer Jim Jarmusch at his best, a seemingly trivial and glancing examination of a Paterson, New Jersey bus driver also named Paterson whom we get watch as he goes about his day, waking up next to his wife, clocking into work, driving his route around the downtown area (it seems), listening to rich chunks of fascinatingly inane small talk from his passengers and, most telling, having lunch. Paterson the driver, living in Paterson the city, echos the legacy of Paterson the epic poem by William Carlos Williams, the great American poet and and a Paterson native son. Paterson, the driver, writes poetry on his lunch break, and in the course of the film viewers have the only film about a poet I remember that showed the writing process in effective movie terms. The poem, in the driver's hand writing, appears on the screen as he composes and we listen to the poem in his voice being created; revisions are made, lines and words crossed out, new phrases are introduced, what begins as seemingly prosaic and ordinary becomes something extraordinary , worh noticing, an idea beautifully expressed and preserved in words. This is the beauty of Jarmusch at his best, finding rich and resonating veins from the everyday, bits of modern life uncluttered and made just slightly odd. Humorous, touching, perfectly disarming , this movie is also particularly in small pleasures that are matter of fact, bits of surprise with no fanfare, one of which is that the Paterson the driver/character living in a city named Paterson which is also the title of an important American poem is portrayed by Actor Adam Drive. Intended or by coincidence, I think that is very, very cool in a satisfying small way. Colossal, a fine indy film written and directed by Nacho Vigalondo. The premise is this: a young woman loses her job and boyfriend in NYC and, unable to find work and broke as well, moves back to her home town to stay in her parent's empty house. At the same time, a giant monster begins to destroy Seoul , Korea . The woman realizes after a while that she has a mysterious but very direct connection with the monster destroying a city a half a planet away. Science fiction, romantic comedy and psychological thriller in a well executed fusion of what would conflicting genres, writer and director Vigalondo does not merely mash together disparate kinds of pop culture, but instead weaves them together. Without going into tidbits that would spoil the film, I would just add that the script is as tightly constructed as it is wildly imagined and it requires to suspend our disbelief a little further and, in a more challenging aspect, to suspend it in ways not usually demanded of us as viewers. Think of this: if one's actual life seems to slip, merge, evolve and abruptly change tones, perceptually, from being a comedy, tragedy , romance and soap opera in the course of month, a week, a day, why wouldn't this also hold for a fictional , more fantastical world? Colossal does , I promise, contain all the elements I've mentioned, and they are pertinent to the story being told, but this a narrative with the varied genre restrictions removed. For all that seems fantastic and scary, the players and their situations and how they respond to the changes that happen to them are, (ahem) human, all too human. Odd, quirky and defying genre expectations, this is splendid and engrossing story, with a perfect ending to seemingly unresolvable complications that you didn't see coming. Fine performances by Anne Hathaway and Jason Sudeikis.